I have always planned things in advance and then come to a point where these things that once made me want to JUMP! out of excitement, don’t seem exciting any longer. I have faced this problem for the better part of my teens and still do now in my twenties. I have constantly found myself in this fight. 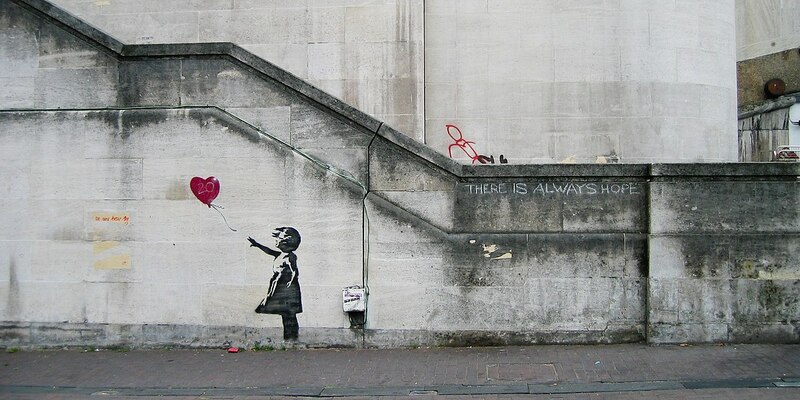 Do you know Banksy? He is a street artist famous for his graffiti art on the streets of London. His famous painting- “Balloon girl” fetched $1 Million dollars at an auction and moments later, Banksy passed it through the shredder. Yes, he did it. Also, his original work has been sold on the streets of New York for just $60. Because of the kind of work he does, he keeps his identity hidden. Surely enough, here is an artist who doesn’t care about the fame or the money. Then why do it? For me, the “Balloon Girl” clearly depicts the situation I am trying to put forth. What do you do when you see your life slipping by and you seem to have no control on your surroundings and situations, none at all! But correct me if I’m wrong, isn’t this the only time when staying focused counts? If your answer to the question above is yes, please read forward. Even if it is a no, keep reading forward, what else do you have on your schedule anyway? 😉 (excuse my jokes, I am working on ’em) I have gathered some thoughts that I want to share with you which will help you to stay focused on your goals and desires at this crucial point in life. It’s time to break the rear view, now. Most of the discouragements that come my way are due to things that I have done or have happened to me in the past. Now is the right time to shut down that of the past voice and believe your gut feeling. Mute it. Burn it. Bury it. Do whatever you can in your capability, jump on the big red button and let every past thing go down the trash. You have already learned from your mistakes (I take that if you are reading this post you are wise to know that you are not perfect.) Past experiences will always be with you as sweet wisdom but don’t allow them to be the cords pulling you down. Stop judging yourself by your past. Believe in Grace and Mercy. There is always more in you than your feeble capability can fathom. Learn from your mistakes, don’t live in them. We have the power to start afresh. And there is nothing bad about a fresh Monday morning. Once you are 20+ it is inevitable that the thought of your monthly paycheck wouldn’t cross your mind along with the fears that come with it. A precise question would be, how many zeros will your paycheck have or how much will you earn. That’s a trick question. Remember, aim at the fish’s eye. Not the whole fish. Let me narrow it down for you, what do you want to earn? If your answers is just money then please have a real look at yourself in the mirror and try putting a cost on yourself. If you land on a number please move forward in the direction you are going. (none can help) If not, continue reading. If you answer in words like respect, influence, social good, money, prosperity in your work, being called a hard worker, able to feed many people. Then you totally get my point. A million dollars will not help you if are not able to help others and yourself. We all have a limited amount of time on Earth and if we spend it hoarding our basements then we truly are a hopeless bunch. But if we sastisfy ourselves with the little we have and savour it, there is no one richer than us. So be very sure of what you want your paycheck to look like. Your life is more than just collecting pieces of mere paper. Hard work is the only option in this MCQ. There is something really wrong in watching people who are prosperous at doing what they love and learning from them, without knowing their complete story. I have never found a single person who was born with a golden spoon. Everyone I have learned from have had very humble beginnings. Some even more humble than mine. Therefore, though I am unsatisfied of where I am right now, I count myself blessed because of the resources I have. Most people only dream of them. Once a person starts enjoying the work that is in line with their dreams, he or she narrows why they want to do it. You can never work hard to do something you do not have a motivation from within for. Abharam Linchon famously said,” Give me four hours to cut down a tree and I will spend the first three hours sharpening the axe.” It’s the monotonous work of sharpening your tool that requires your energy more than the cutting of the tree. The tree will fall down eventually. Being O-Kay! with being wronged. Since you are planning to spearhead a movement, a job endeavor or even a small team of five, you will be wronged and portrayed on the shady side. You see, expecting everyone to do as said is your shortcoming, not theirs. They don’t know your struggle and how much you want your ‘thing’ to succeed. But be okay with it. Feel bad. But be okay and don’t hold it against them. It could be that they never got the leader they thought they deserved. In fact, you need to respect them for believing in something that has not yet taken half its form and be patient with them. They are being patient with you. See, since you are just beginning , it’s necessary to give each other the freedom they deserve and let time teach everyone what they need to learn. This is the case when you are in a team of people who believe in the purpose of what you are doing and you are facing positive criticism. If you are facing trolls and looked down upon, cut your ties with them as soon as possible and don’t look back. Thanks to the BJP, we all know what trolling means. Here is a definition of a critic, “A person who expresses an unfavourable opinion of something.” First, learn to differentiate between who are your critics and trolls. Second, totally focus on the critics. When I was young, I was taught in my moral science class about how good positive criticism can be. This information has proved priceless over the years. To be able to face criticism and then work on it has been a quality of successful men and women all throughout the world. Discretion is something that helps you know your shortcomings through a person and then makes you work on it. It lets you stay humble, make mistakes and learn. Believe me, if you think you are done making mistakes, you are very wrong. In fact, let the people around you know that you are open to criticism and ask them for their opinion and then let your wisdom decide whether or not you should work on it. When was the last time you laughed at yourself? If you ever want to succeed at something, stop taking yourself seriously. That’s the only way, really. This also helps you move forward and to stay focused. Your ego is too small a price you can pay for your mission. I would love to explain you the tiny bits of wisdom I have gathered throughout my years. If you liked this piece and would like to talk more. Feel free to comment. That’s wonderful to hear. Glad you liked it.